AHSEC, Junior Assistant recruitment 2018: Hello friends, here we bring a very very good news for you all jobseekers. Here we bring AHSEC, Junior Assistant recruitment 2018 news for you. 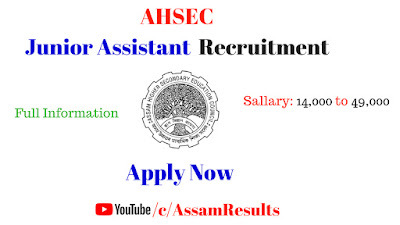 AHSEC released an advertisement for the post of Junior Assistant in the office of the Assam Higher Secondary Education Council in the Pay Scale of Rs.14,000-49,000/- p.m. (PB-2) and Grade Pay of Rs.6200/- p.m. plus other allowances as admissible under Rules. So, all job seekers read this article for the proper information of AHSEC, Junior Assistant recruitment 2018. 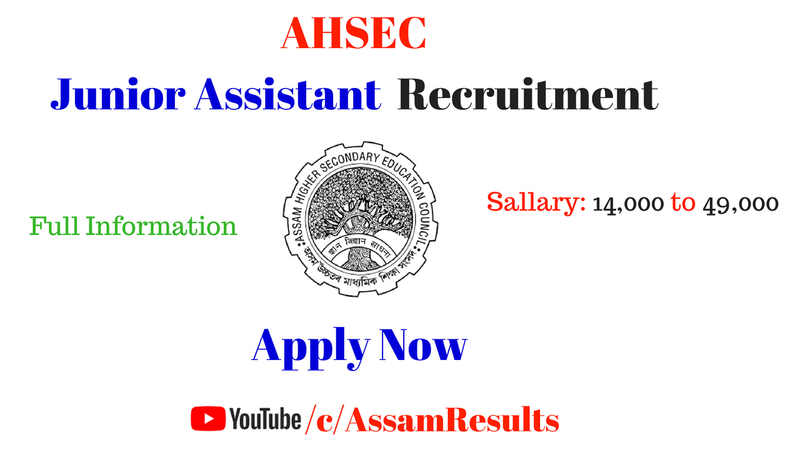 Online applications are invited for the post of Junior Assistant in the office of the Assam Higher Secondary Education Council in the Pay Scale of Rs.14,000-49,000/- p.m. (PB-2) and Grade Pay of Rs.6200/- p.m. plus other allowances as admissible under Rules from eligible intending candidates who are citizens of India. Name of the post: Junior Assistant. 31 including reservation for ST(P), SC, ST(H), OBC/MOBC and Differently abled as per Govt. rules. Must not be less than 18 years and not more than 44 years as on 1.6.2018. Upper age limit is relaxed by 5 years in case of SC/ST candidates and 2 years in case of Ex-serviceman. Higher Secondary Examination or its equivalent examination passed from a recognized Board/Council with 6 months’ Certificate Course in Computer Skills from recognized Institution with proficiency in Assamese and English typing. The application will be received only on online from the candidates through the website – www.ahsec.nic.in from 15th May 2018 to midnight of 30th May 2018. 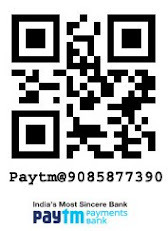 Application fees: Application fees of Rs.350/- (Rupees three hundred fifty) only is to be deposited through Netbanking/Debit Card/Credit Card etc. In case of SC/ST candidates 50% of the fee will be applicable (Rs. 175/- only). From 15th May 2018 to midnight of 30th May 2018. The name of candidates who will qualify in the written test examination will be published in the website and they will bring their original testimonials for verification along with a set of self-attested photocopy of testimonials before the Interview Board at the time of eligibility test. f. Discharge Certificate (applicable to Ex-Serviceman only). Reservation for Ex-serviceman will be maintained as per Govt. existing rules. g. Candidates qualified in written test (OMR Sheet) will have to appear for a test for computer eligibility. 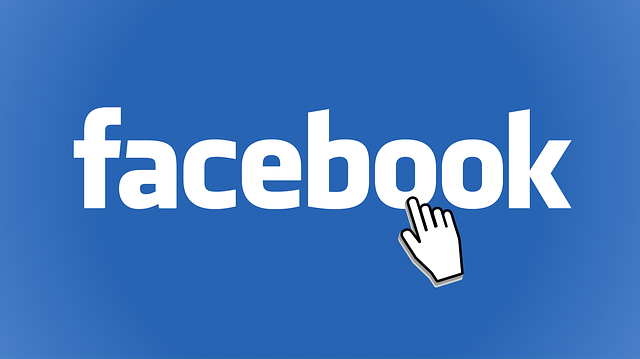 Applications not accompanied with all necessary information as required in the online application will be rejected. No TA/DA will be admissible for attending the Test/Interview. The venue and date of Test/Interview will be notified in the website/newspaper later on. Canvassing directly or indirectly will automatically disqualify a candidate.  After submitting the online application form, the candidate should get the print out of the application form on A-4 size paper. In that printout, the candidate will get space for signature. The printed signed application should be submitted along with self-attested copies of mark sheet and a certificate in support of educational qualification, experience, caste, disability etc. for further authentication of his/her candidature, before the interview board for verification at the time of interview/ viva-voce.  Candidate should be very careful while submitting the online application form. Only one-time submission of online application form is allowed and no correction/addition of any information is permissible once the application is submitted.  After submitting the online application form, the candidate will get an Application Receipt Number (ARN) against the application and will have to quote the ARN for all future reference.  Candidates have to appear in written test/interview as per the scheduled date which will be notified later on in due course through email, telephonic message, the website of the Council and Newspaper. No individual communication will be made.